Apple Computer has been widely acknowledged as a leader and innovator in personal computing. 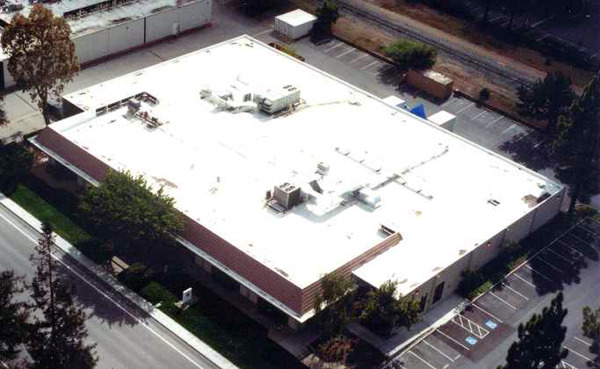 For all their forward thinking and creativity, they faced a problem all too familiar to other more mundane industries; “How to prolong the life of their degraded roof?” The aged built up roof (skin) on their 28,500 ft2 facility in Cupertino, CA leaked and was in poor condition. Moreover, its dark color contributed to very high air conditioning bills. There were also numerous leaks at privacy/wind screen supports and the roof had poor drainage. Numerous roofing options were considered, each promising to solve their problems, but most at a very high cost. After a critical review of the roof needs and the options proposed by several contractors, Apple chose the National Coatings Corporation AcryShield® Roof Restoration System. Since the roof was in generally sound mechanical condition, the roof restoration system took advantage of the existing life of the roof, allowing the roof to be kept in place and without the need for an expensive tear off. Leaks around the many screen supports were eliminated using an innovative sprayed polyurethane foam sealing system. Additional slope was created and ponded areas were eliminated using the SPF material. Then the entire roof was coated with a primer coat of AcryShield acrylic roof coating. While the coating was still wet, polyester reinforcing mesh scrim was embedded into the coating. After drying, a second coat of AcryShield roof coating was applied. This system created a monolithic seamless fully adhered, reinforced membrane to the existing roof. 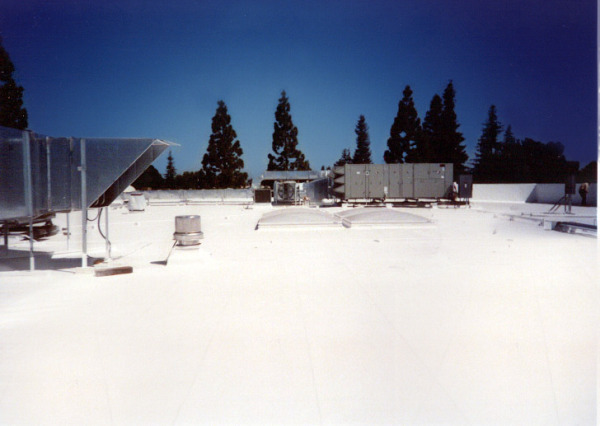 Moreover, the white color with its high solar reflectance and emittance dramatically reduced the cooling load on the building, thereby reducing air conditioning energy costs. The roof was restored without costly and disruptive tear off. The leaks were eliminated and additional slope was created. The AcryShield system provided an additional 30 dry mils of coating plus increased tensile strength from the polyester reinforcing scrim. The roof is easily maintainable, as it can be recoated as needed, usually every 8-12 years. This option has the lowest life cycle cost of any reroofing option. Often times your roof gets neglected, as it is unseen. Unless you physically go up onto the roof, you won’t know if there is damage, cracks, splits or blocked drainage unless it begins leaking inside the building. If you wait until this happens, it’s often too late and you are left rushing to choose the fastest roofing option to solve the leaking water as quickly as possible. We want to encourage you to be proactive so you can save yourself the extra cost, time, and stress. 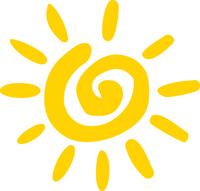 Summer is a perfect time to find a roof coating system that fits your roofs particular needs. Elastomeric roof coating systems offer multiple advantages over traditional roofing options as they require less time for installation and application, reduced costs, lengthened roof life, and these roof coating systems are sustainable - allowing you to recoat your roof every 10-15 years to avoid a roof tear-off forever. Dry, warm weather is the most ideal weather condition for application of a roof coating system, making the summer an excellent time to restore your roof. Traditional roofing requires a roof tear-off after two roofs have been installed on a building. This is a building code law that is enforced and must be abided by; however, installing a roof coating system allows you to avoid a roof tear-off (indefinitely, might I add) as these systems do not bare the weight of a traditional roof, allowing roof coating systems to be exempt from this code. When you restore your roof with one of our roofing systems you save yourself time - no business closures, no tear-off stages, and an easy application process. You also save yourself money - there are no landfill fees and shorter construction time because the roof coating system is spray applied directly over your existing roof membrane. Business is conducted as usual so you don't lose production or sales efforts. 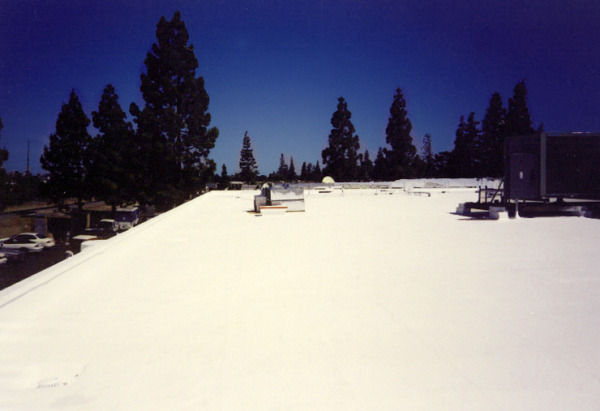 Another advantage to roof coating systems is they are seamless. When applied, these systems are sprayed onto your rooftop allowing the coating to spread and bond together; filling gaps, seams, joints and cracks, covering necessary areas around pipes, drains and equipment creating a durable, monolithic, custom installed, watertight roofing system particularly created for your individual roof. For more information on roof coating systems, download our FREE Guide to Roof Coatings and get our Benefits Brochure!